The Government of India introduced the concept of chemical hubs, calling them Mega-Chemical Industrial Estates (MCIES) in 2005, but a year later enlarged it and introduced the concept of Petroleum, Chemicals ad Petrochemicals Investment region (PCPIRs). Nandigram was scheduled to be one of these. The site is located in East Medinipur district of West Bengal, India. The place is about 160km away from Kolkata. Nandigram was designated as Petroleum, Chemicals and Petrochemicals Investment Region and a special economic zone (SEZ). The notification for land acquisition was published in 2005, but the actual conflict began in January 2007 when the acquisition program started . The local people, particularly the farmers, had been protesting against the Communist Party of India (Marxist) government to acquire agricultural land for setting up a Special Economic Zone (SEZ). 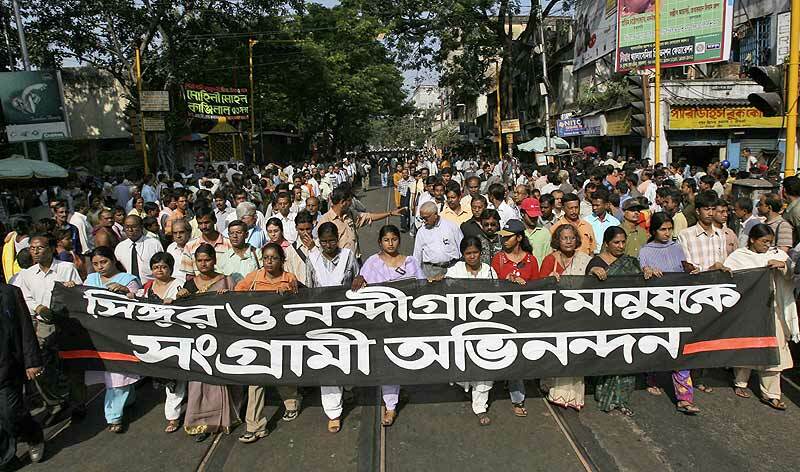 West Bengal police fired on protestors on March 14, 2007 killing 14 people at Nandigram . A mob of nearly 5,000 villagers in Nandigram bloc in East Midnapore district fought against the police and security personnel . This incidence played an important role in the politics of West Bengal for next few years. Mamata Banerjee the leader of opposition of the then west Bengal assembly widely used this issue along with the political slogan ‘Ma Mati Manush’ (Mother, Land, People) in their election campaigns. Trinmool Congress Party (TMC) took the full advantage of the acquisition scare among the local villagers. With her 'Ma-Mati-Manush' slogan, she hijacked the issues from the Left parties and win the assembly election in 2011 [3, 4]. The state cabinet later endorsed a plan to locate the Indonesia-based Salim group's chemical complex on the strip of land, called Nayachar (new sandbank) along the Haldi river by the West Bengal government. The chemical hub would be set up as a joint venture project of West Bengal Industrial Development Corporation Ltd and New Kolkata International Development. Indian Oil Corporation would be the anchor investor there. The NKID comprises three companies including the Salim Group of Indonesia. Nandigram was chosen as a chemical hub because of the place’s strategic location. The area located near Haldia, port. The proposed chemical hub was created in 2006 through the SEZ Act of 2005. Salim Group of Indonesia was given responsibility by the then left front government of West Bengal. However, due to heavy resistance from the local people and also from other corner of the society government decided to scrap the project in 2007 . 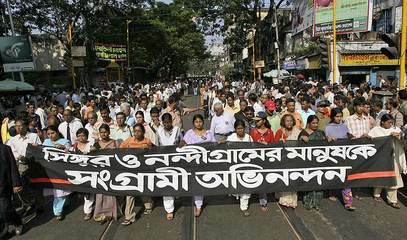 Intellectual persons from West Bengal had raised their voices. Development of Alternatives The activists and local people were against the land acquisition for the proposed chemical hub. They wanted the project to be stopped. In the 2008 local election, the voters of Nandigram voted against the then Left Front government's policy of industrialisation and cultivable land acquisition. One candidate from the members of resistance committee was elected in the state assembly with huge margins of votes defeated front's candidate. The villagers were protesting against a move to acquire their land by the West Bengal government for setting up a special economic zone. The Nandigram firing along with the agitation at Singur in Hooghly district against setting up of a small car plant later paved the way for Mamata Banerjee's Trinamool Congress to power in the 2011 assembly election with a majority. A division bench of Calcutta High Court had taken ‘suo moto cognisance’ of the police firing and had ordered a Central Beraue of Investigation (CBI) a central government’s investigating agency to probe for the incident. CBI had submitted a preliminary report after which the High Court termed the firing as unconstitutional and directed CBI to continue with its probe into the incident. Development of Special Economic Zones in India: Policies and issues edited by Mookkiah Soundarapandian.